Feb 10 - “Sts. Benedict and Scholastica” © artwork by Julie Lonneman. Happy Feast Day St. Scholastica! 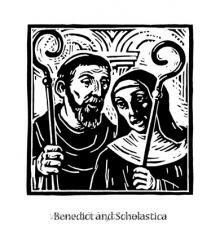 Once a year, Benedict and Scholastica would meet together. During this annual visit, Benedict and Scholastica would talk about God for hours. On one particular visit, after they dined together, Benedict was preparing to leave, but Scholastica begged him to stay so that they might continue their conversation. However, Benedict’s rule did not allow him to spend a night away from the monastery. Scholastica prayed that God might allow Benedict to stay for the evening. Suddenly, there was a huge rainstorm, so large that Benedict did have to remain in the shelter with his sister. Only three days later, Scholastica died. While Benedict had at first been annoyed by his sister’s prayer, through it he eventually came to see that the greatest work that he could do was not to keep his rule, but to love each person he met by giving each person his full attention.